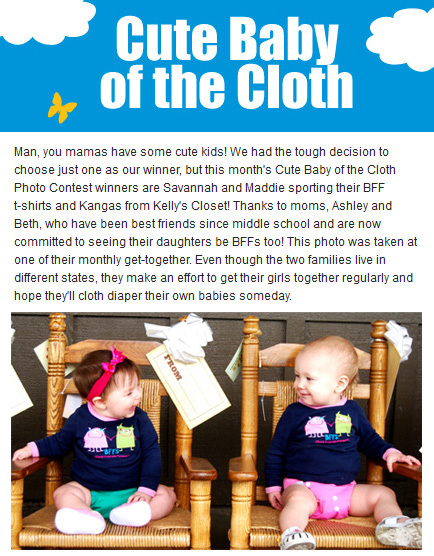 So remember the picture of Savannah and Maddie that we submitted to a photo contest? Well, our efforts paid off because we won! :-) I am so proud of my little girl! Unfortunately, no. They totally should have sent us a coupon for more cloth diapers, at least! 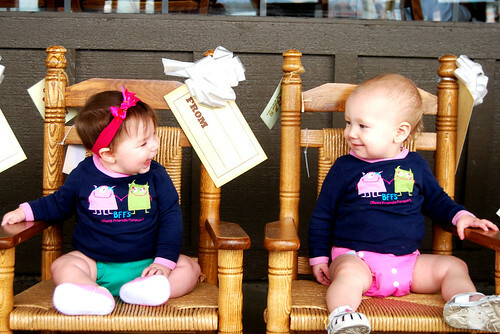 Hehe Actually the diapers that Savannah and Maddie are wearing in the picture (Baby Kangas) aren’t even sold there anymore! Too bad, they are both Beth and my favorites. Congrats! Your pictures of the girls are fantastic. Did you see in the video, there was a baby wearing the same BFF shirt as Savannah & Maddie at the 1:43 mark? Woo-hoo, that’s awesome! And of course you’re not surprised because Savannah is a total cutie. Darn it – you shoulda won something. Wow! You won! So fun! Stinks that you don’t get a prize, though. :-\ Super cute picture of super cute girls, though!